Drowsiness significantly increases the risk of all accidents especially tractor-trailer accidents. Whether the cause is accumulated sleep deficit, sleep apnea or some other factor, fatigue can cause truckers to commit serious errors. In fact, the statistics are alarming. The National Transportation Safety Board estimates driver fatigue is responsible for 40% of the accidents. The National Traffic Highway Safety Administration calculated there are at least 56,000 sleep-related road crashes annually. And, the National Traffic Safety Board has reported that over 50% of long-haul drivers have fallen asleep at the wheel. To combat driver fatigue, some drivers are turning to fatigue warning devices. These devices monitor the driver's eye closure rate. If the device senses an unsafe pattern, an alarm will sound. But, not all drivers and companies use these devices due to cost and other reasons. If you or a loved one has been injured in a tractor-trailer accident, our experienced trucking lawyers can help protect your rights and recover your losses. We know the federal trucking regulations, and we know how to investigate your accident so that valuable evidence is not lost or destroyed. Contact us today at 615-742-4880 or toll-free at 866.812.8787. Or, complete this short online form to schedule a free, no-obligation consultation. The New York Times recently reported a decline in manners and social etiquette. Unfortunately, this can be seen everyday on Tennessee roadways. The AAA Foundation for Traffic Safety reports 62% of motorists have been the victims of road rage. The most common form of road rage is aggressive tailgating. While not as pervasive, another common form is deliberating obstructing or cutting off another driver. In a 2007 study, the Federal Motor Carrier Safety Administration released a study which revealed 7% of all trucking crashes are attributable to road rage. Depending upon the level of road rage, the driver's conduct may be considered reckless, which may entitle the victim to both compensatory and punitive damages. If you or someone you love has been the victim of road rage that resulted in a serious accident, call us today and let us help you hold the other driver accountable and get the maximum compensation reasonably possible. Most motorists speed because they are in a hurry to get to their destination. Truckers are no exception. In fact, they are arguably under more pressure to get to their destination quickly because their livelihood depends upon it. If they are late, their company may get penalized with a monetary fine or the load may be refused. They may have encountered bad weather or traffic and so they are speeding to make up time. Whatever the reason, there is no doubt that speeding trucks are extremely dangerous. Because of their increased weight and size, trucks have increased stopping times even when they are not speeding. Speeding makes it much more difficult for them to stop if traffic suddenly slows or stops. 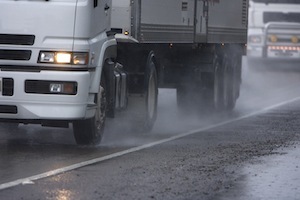 Accidents caused by speeding truckers can easily be prevented. Since 1992, trucks have been manufactured with governors, which allow a company to set the top speed of the truck. But many trucking companies and individual truckers do not use them. Again, the quest for profits overrides safety. Most trucks have a "black box" onboard which stores valuable information including the speed at the time of the crash. If you or a loved one has been hurt by a speeding truck, contact us today so we can protect this valuable evidence and your rights. Call 615-742-4880 or toll-free at 866.812.8787. Our team of truck accident attorneys are here to ensure careless truckers and trucking companies are held accountable when they engage in dangerous activities like overloading trucks. We want to make sure you receive the maximum compensation reasonably possible. If you need an an experienced truck accident attorney, contact us today at 615-742-4880 or toll-free at 866.812.8787. Trucking companies must randomly test their drivers for drugs and alcohol. In addition, a truck driver must be tested for the presence of drugs and alcohol if the driver was charged with a moving violation or if the driver was involved in an accident that resulted in a fatality or serious injury. Despite these precautions, drivers who are under the influence remain a significant threat to other motorists. Reflexes and responses which are delayed even slightly can produce catastrophic results when an 80,000 lb. tractor-trailer is involved. One of the most important things you can do after an accident with an impaired trucker is to call our team of experienced trucking attorneys so that we can gather critical evidence, protect your rights and ensure you receive all of the compensation you deserve. The Federal Motor Carrier Safety Administration has established strict rules for a commercial driver's hours of service (HOS). The HOS regulations dictate the number of rest and driving hours for truckers. By law, truckers must carefully log these times into their log books. Unfortunately, too many truckers falsify their logs and drive longer than is legally permissible. As a consequence, they become fatigued and make serious, and sometimes fatal, mistakes. Our experienced team of trucking lawyers knows how to cross-check a driver's log with gas receipts, trip tickets, bills of ladings and other data to determine if the driver has falsified his logs. If you have been injured by a tractor-trailer or other big truck, put our team of trucking lawyers to work for you. Call us at 615-742-4880 or toll-free at 866.812.8787. Or, you can complete this short online form to schedule an appointment. Because driving a big truck is dangerous, truck drivers are required to have a commercial driver's license (CDL). Usually, this requires the driver to graduate from a driving school and complete an apprentice-type period. Even after obtaining a CDL, truckers have ongoing training requirements. This training is critical because it teaches drivers how to respond to bad weather, mechanical failures, poor road conditions and emergency situations. If a company allows a trucker to drive one of its rigs without proper training, the company can be held independently responsible in the event of a wreck. Similarly, trucking companies have a duty to make sure their drivers are following the law. If a trucking company knows its drivers are falsifying logs, speeding, using drugs, etc., the company must take action. If it fails to do so, the company may be independently liable for any accidents by that trucker. And, if the conduct is egregious enough, the victim may be entitled to both compensatory and punitive damages. If you have been involved in a wreck, you need our experienced team of trucking lawyers to investigate the accident and determine improper training or supervision played any role in the wreck. Call us at 615-742-4880 or toll-free at 866.812.8787 fill out this online form and let us get to work fighting for you. Tractor-trailers and other trucks are expensive to maintain, so a lot of truckers and companies cut corners in hopes of saving on costs. But tragically, it costs lives when trucks with faulty equipment are on the roadway. Our team of semi-truck lawyers is well-versed in reviewing a truck's preventative maintenance schedule and repair history and looking for gaps, errors and oversights. Sometimes, the maintenance and repair work is performed by outside companies and it is crucial to obtain the paperwork from all responsible parties so a complete investigation and assessment can be performed. In some instances, the maintenance and service history is fine and the problem lies with a defect in the manufacturing or design process. If faulty equipment played a role in your trucking accident, call us today and our team will conduct a thorough examination to determine who is at fault and then hold them responsible. Call us today at 615-742-4880 or toll-free at 866.812.8787 or fill out this online form to schedule an appointment. Driver errors can take many forms: failing to check blind spots, making too wide of turns, driving too fast for conditions, depowering the front brakes and using only the trailer brakes in an effort to minimize wear and tear on the brake system and tires, etc. In a number of cases, the only known witnesses to the accident are the actual people involved in the wreck. When this happens, trucking companies and insurance companies will roll out a team of experts to try and help them prove it was not their driver's error that caused the accident. You need the same resources and capabilities to protect your rights. We work with accident reconstructionists and other experts to help level the playing field for you. For more than 80 years, we have been the voice of injury victims. If you have been hurt in a truck accident, call us today and let us speak for you -- loud and clear. Call 615-742-4880 or toll-free at 866-812-7878 or simply fill out this online form. Distracted driving is dangerous driving, but unfortunately it happens all too often. Incredibly, truckers driving 80,000 lb. tractor-trailers at interstate speeds are often texting while driving, eating while driving, adjusting navigation devices, talking on their cellphones, etc. This is a recipe for disaster. According to a Carnegie Mellon study, talking on a cellphone reduces the amount of brain activity used for driving by 37%. According to the National Highway Traffic Safety Administration, in 2009, 5,474 people were killed in distracted driving crashes and another 448,000 were injured. Cellphone companies are only required to keep activity records for a limited period of time, and this data is crucial to proving a truck driver was texting or talking on the phone at the time of the accident. So don't wait, contact our team of semi-truck lawyers today. We have over 80 years of experience in handling trucking accidents, and we can help you. Call us at 615-742-4880 or toll-free at 866.812.8787 or simply fill out this online form.